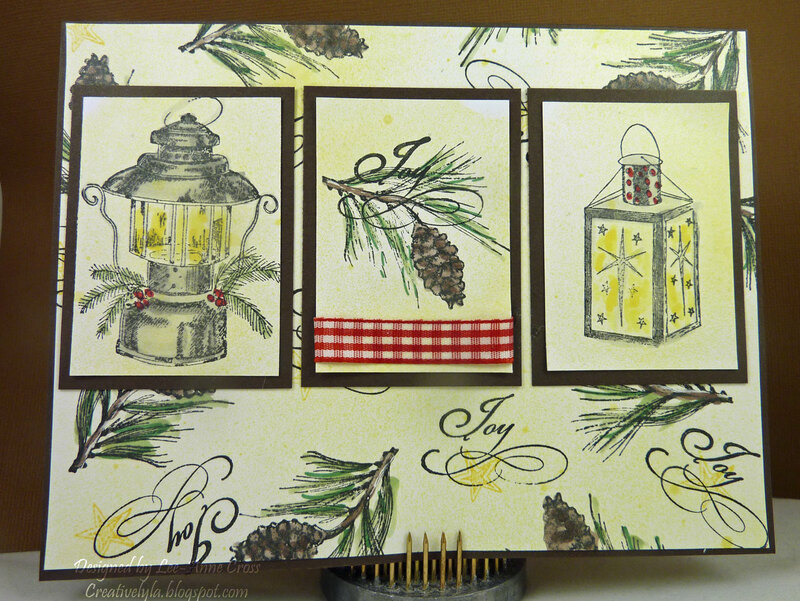 Well it’s time to get crackin’ with the Christmas cards so that’s what I chose to do for the Sketch Challenge over at Splitcoast today. My card base is 5″ x 6.5″ to allow for the three panels. I love to make my own designer paper and started out with a piece of white card stock that’s slightly smaller than my card base. Step one was to stamp the little pine boughs randomly over the page. When I do this, I turn the stamp several different ways throughout the process and make sure that some of the stamping goes off the page. Each little image was loosely colored with Copics and I added some highlights with a white gel pen. Next, I stamped the little gold star image, again randomly, over the page. Then I spritzed the page with Glimmer Mist. And for the final step for the background, the “Joy” image was stamped randomly. The three panels were all stamped, colored with Copics and also spritzed with Glimmer Mist. I added a little piece of gingham ribbon (thanks Kathy!) to the center panel and a little bit of red Copic on each of the other panels for a little pop. The panels were then layered on the same card stock that the card base is made from. Have a wonderful Wednesday everyone!